Wager Gaming Technology has released a new online video slot in honor of the 2014 Olympics that are taking place in Russia. The new 5 reel and 30 payline slot game is called Golden Reels and is a true tribute to the honored games. 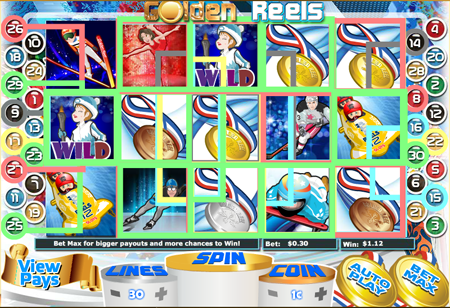 The reels of the online slot sit on a background that includes the 3 Olympic pedestals and the symbols are ones that depict some of the different sports that are represented at the 2014 Olympics. A Ski Jumper, Bob Sledding, Speed Skater and Gold, Silver, Bronze medals. The wild symbol is a woman holding the Olympic torch. The Scatter symbol is a Snow Boarder character. There is no interactive bonus round to speak of, like a pick me bonus for example, other than a free spins bonus. The scatter symbol is the symbol needed to commence the bonus round. When 3 or more of the scatters land in the reels scattered about, the player is awarded 10 free games. So what is so special about these free games. Well, this is why the free games bonus round is a great substitute for an interactive bonus round. It’s because the free spins come with a 4 times multiplier. That’s right! All wins during the free games are quadrupled! Not all of us can enter into the Olympics but that does not mean we cannot go for a medal or to from the sidelines. Go for the gold playing Golden Reels video slot at your favorite Wager Gaming Technology online casino today!